Given such statistics, how did Tom manage to avoid is own pitchfork, much less encourage us to avoid ours? In the course of this show, Tom explains how he remains hopeful in the face of such numbers. It’s a matter of both planting and watering wisely. Tom doesn’t advocate abandoning all lawns, planting only natives, or giving up every water-hungry hybrid. Instead, he helps people convert their lawns to less thirsty grasses. If your taste leans toward the latest cultivar, he advises setting up a special space for such exotics and then doing what you can to reduce water use on it: enclose it to protect it from drying winds, water it in early morning to minimize evaporation, and so on. I tend towards a more dour, apocalyptic, approach, so it is useful to be reminded, first, that most Americans and Canadians are not going to give up their lawns or their hybrids this year, and second, that much can be done to save water short of such drastic measures. This is a gentler approach than I’m sometimes inclined to take, and it reminds me that guilt is not an especially good teacher, and that working with people generally gets you further than lambasting them about their failures. Edwin Beck may be an entrepreneur by trade, but he’s also a back-yard gardener with a real concern for the environment. In designing these rain barrels, he’s braided these three threads together. You can listen to our conversation as he explains how he and his colleagues set about accomplishing these ends. A graduate of the NewYork Botanical Garden School of Professional Horticulture, Tom gives occasional lectures and seminars both there and around the country. 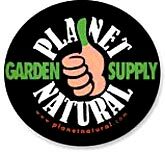 His several books (see below) include the 1998 Water-Wise Gardening, which testifies that sustainable gardening has long been one of his major interests and concerns. 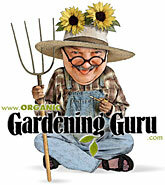 Several years ago he gave up being a garden columnist for the uncertainties of full-time writing. 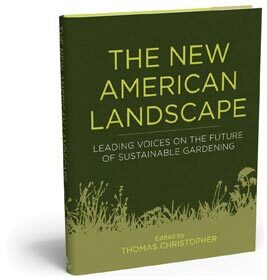 One result is The New American Landscape, which features chapters on sustainable ideas for the backyard gardener (David Deardorff & Kathryn Wadsworth), meadows (John Greenlee with Neil Diboll), balancing natives and exotics (Rick Darke), green roofs (Edmund C. Snodgrass and Linda McIntyre), gardening to attract wildlife (Douglas Tallamy) and more. Edwin has his own company, Big Red Rooster, but also acts as a consultant for EarthMinded, the makers of RainStation water barrels, which he helped design. 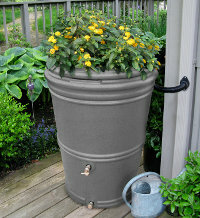 He’s also a dedicated gardener, and is convinced that the potted tomatoes on his patio, which receive water only from the water barrels, taste better, ripen sooner, and are all-round healthier than the ones in the garden, which receive municipal water. And in case you were wondering, they have the same soil. –I wish I could highlight a few key facts from this document, including one that Tom cites in the course of the interview: that water levels in Tuscon and Phoenix have fallen between 300 and 500 feet. But that doesn’t touch the situation in Chicago, where “long-term pumping has lowered groundwater levels by as much as 900 feet.” This not from the level-headed United States Geological Survey (USGS). –Discusses attempts to implement water-saving practices at parks as disparate as The Royal Botanical Gardens in Kew, Britain, and the Lady Bird Johnson Wildflower Center in Austin,Texas.